June | 2015 | love lives on. I got Melvin seven years ago. The day joy leaped into my life. 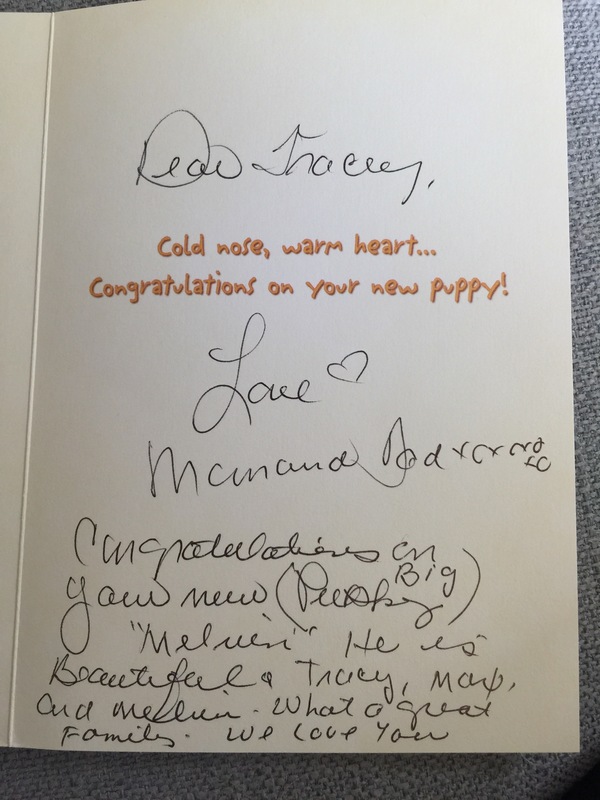 I was going through his folder a few months ago and I had come across a few of the cards we got when Melvin joined the family. I set them aside to use on his gotcha day post this year. Of course at the time, I was under the impression that he’d be here. They mean so much more to me now and they take me back to the fate filled day that Melvin became mine. Melvin lives on in so many things. My heart, Jake’s perseverance and our calling to help others. And now, through Melvin’s Project Joy. We will be using Melvin’s trust fund to pay joy forward. The focus will mostly be on dogs, of the rescue variety, but we have open eyes for all animals who need us. 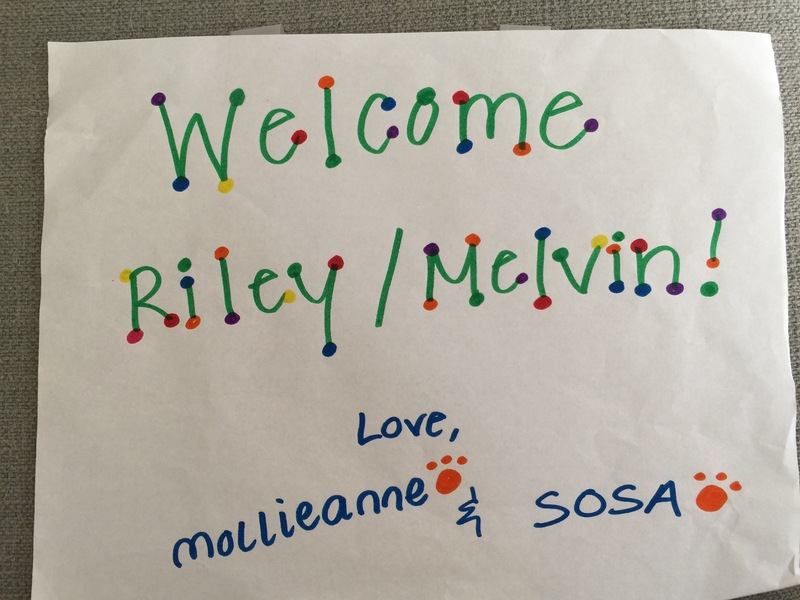 Our first partnership was established while Melvin was sill with me. I reached out to Jen at Sirius Republic and told her I’d like to spread joy using her products and she was in before I even said ‘hello’. (WE LOVE HER!). So over the course of the next year, Sirius Republic and Oh Melvin will have monthly giveaways where you nominate your dude or dudette and we’ll pick two winners each month (a girl and a boy, we are nothing if not equal opportunity givers). There will be categories, we think you’ll enjoy them. It’s not only to give stuff away, it’s to bring folks together. 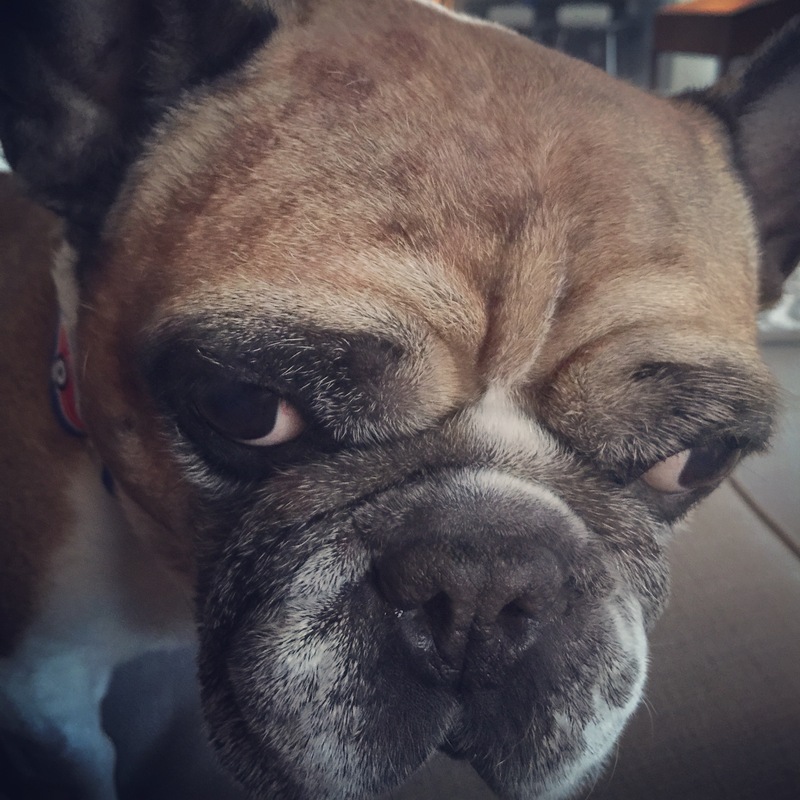 Like one month, you will nominate your allergy-hot-mess-of-an-itchy-dog, and through the various nominations, you will find others who face the same challenges you do. Friendships can form, support can be shared. Joy can be spread. We are all in this crazy world together. I am also working with local rescue groups to help pay adoption fees for some dogs who take longer to find homes and for foster dogs who need some medical care so they can be as healthy as possible when they move into their forever. By pre-paying some of those things, the rescue groups can worry less, and focus more on finding the right homes. Joy heals. Through this project, Melvin lives on. He and I will continue to spread joy. And that joy will in turn spread joy. And that makes me happy. Jake likes me so much more when I’m happy. Stay tuned to both Oh Melvin’s and Sirius Republic’s Facebook page for the first giveaway (sometime in July, we have a few other giveaways to do first)! 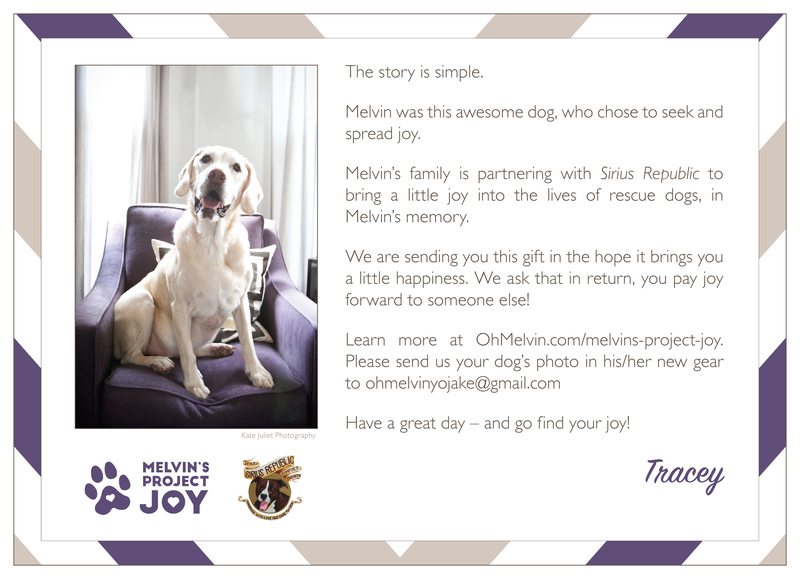 And thank you to all who have helped in this endeavor… Jen at Sirius Republic, Grace, our awesome graphic designer, my friends and family, and especially my parents for their generous donation to Melvin’s fund after he passed away. When they asked me what they could do to help, I said ‘help me help dogs in need’ and they said ‘no problem’. Also, if you need an awesome freelance designer, reach out to Grace (you can find her here). She’s a delight to work with and so talented! How my fear of flying turned into a savings plan. I am terrified to fly. I saw the plane hit the Pentagon and from that moment on, flying has become something that I don’t do well. It has gotten better over the years but it’s something that I know will always be a challenge for me. It getting better is due in part to a man, that I (somewhat) accused of having a shoe bomb on a plane. I mean you can only go up after an incident like that. It was after the (real) shoe bomber incident. I was on a flight and the guy next to me was fidgeting with his feet NON-STOP. He was bent over his body doing something with his feet for A LONG TIME. I could hear and see my own heartbeat. I got up (from my middle seat) and told the flight attendant that he was suspicious. I was 100% sure we had a situation on our hands. This coming from the most crazy terrified person on the plane whose Valium had not fully kicked in yet. (In my defense this was RIGHT AFTER the real shoe bomber incident and I was younger and far less…brave. Today, I would just ask the person what they had going on down there). Turns out the guy next to me with the foot issue, had poison ivy. (This did not make me feel better, but in a different, more itchy way). I had to sit on the plane with him for four more hours. (although they did offer him a seat away from his accuser). He was actually pretty awesome about it. We discussed my fear and he gave me some really good advice. Control the things you can. Have a plan for loved ones, if you have pets, always know what would happen to them if something happened to you. Having your life in order, helps you worry less about it actually happening. I got Max shortly after that. And I never forgot the advice. Max had been our family dog so Max was easy, if anything happened to me, my brother would take him. Melvin was way different. Melvin was a lot of things when I first got him but easy was not one them. His vet bills were astronomical. So I immediately started a savings account for Melvin. To be used only in the case of my death. Even if he went to live with his Godmother, I would still be able to help take care of him and he would never be a financial burden on anyone. They could just love him and always be able to give him the care he needed. I took control. It really did help. I have put money into that account every month for seven years. During the weeks after Melvin’s diagnosis, but before his death, I started thinking about that money. What good could we use it for? If that money was meant to take care of Melvin in a me-less world, how could that money now take care of others, in a Melvin-less world. The answer came very easy. I took one look at my boy and knew that we would spend that money, helping other dogs. Giving the gift of Joy. Next week, I’ll tell you more! But for today, have a plan for your pets. Make sure the person you would want to take them, can take them. Set aside a little money for them, it really does give you some peace of mind to know they will have the care and love they need. And remember, not everyone fidgeting with their feet on a plane, is nefarious. True story. 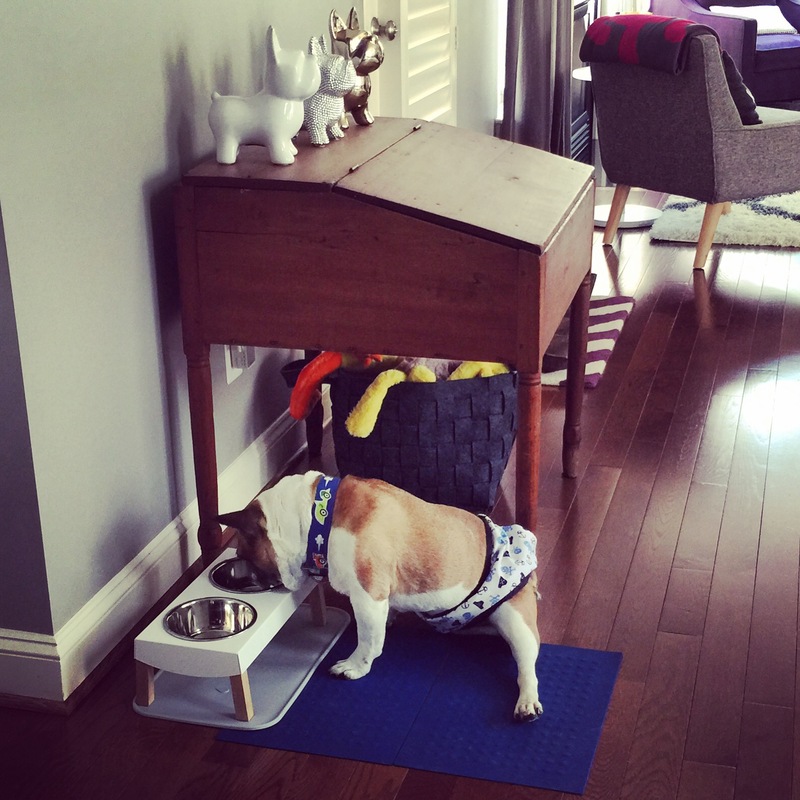 Here is Jake, jazz-lunging while he eats. This photo is an attempt to make you forget how crazy I once was! Jake is showing some signs of aggression towards other dogs. This is not necessarily new news. In the past, when I say he could be a jerk, it was more that from time to time, he gets cranky and is a little impossible for a short period of time. That always equated to him tormenting Melvin. They’d be laying peacefully, Jake would get up, walk over and try to bite Melvin’s face. Good times! But lately, it’s different. 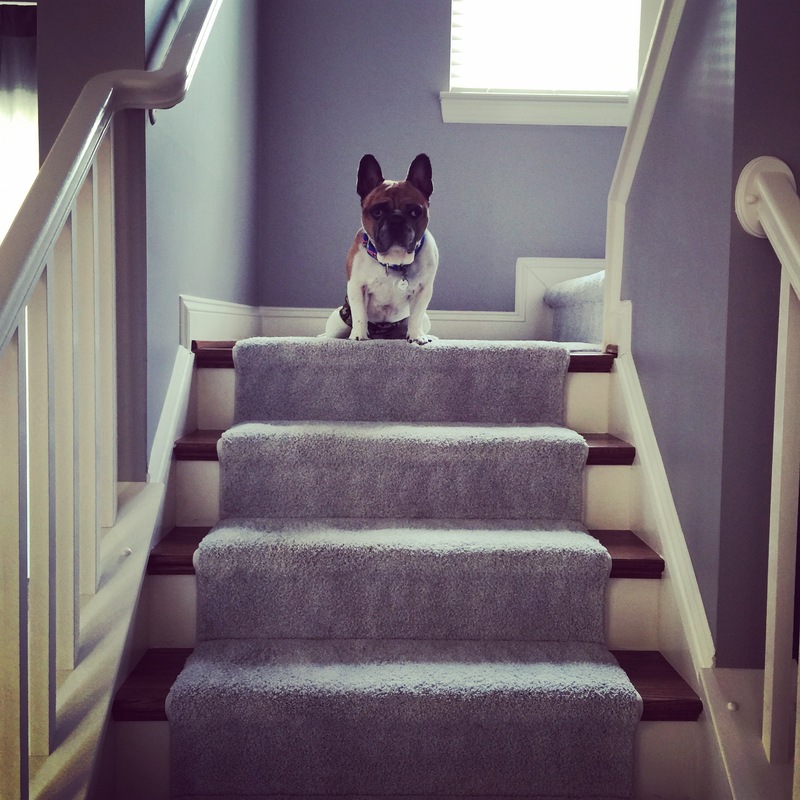 Lately, if he sees another dog he gets riled up and he can’t come back down. I am not a professional, but as someone who spends a lot of time with Jake, I’m leaning towards this being one or two things. The first is the obvious, a post-Melvin world. I don’t know if that means that Jake has a more difficult time in situations because Melvin is not there to help or that Jake can be more difficult, because Melvin is not there. The other issue working against Jake now is his legs. In these moments when his intensity increases, he can’t always remain upright. And each time he falls over, he gets more frustrated and it feeds the situation. To be clear, this is Jake with other animals. 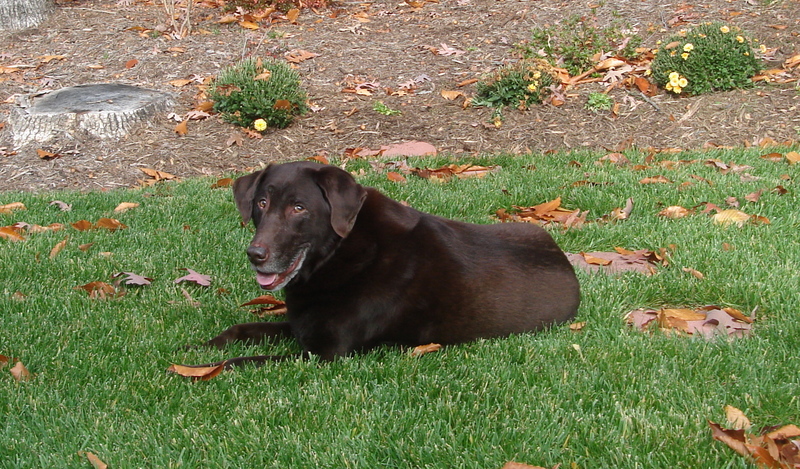 Dogs that he encounters as well as any animal that dares to land or saunter into our yard. With humans, Jake has become quite the opposite. He is calm, attention loving and has been extra wonderful with the kids in our family. Four legs, intensity. Two legs, love bug. We have been working with our trainer. Jake has a prey drive that is unlike anything I have seen. I call him Jason Bourne. When his legs were better, and a bunny family lived in our yard, he would hunt them 24/7. When outside, When inside. Those bunnies haunted him. Those bunnies made the mistake of being in our backyard when Jake was off-leash and sadly two of them didn’t make it back out of the yard. Same goes for a bird that never saw Jake coming. And the frogs. Those poor baby frogs. So the trainer has been helping me help him learn to refocus when he goes into hunt mode. And she is the first person I reached out to when I realized that he is now ‘other dog angry’. Getting another dog is sort of a big deal for me. So in addition to the trainer, we are going to see a behaviorist. Someone who can help us understand the what and why so we can execute on the when and how. I’m super interested in hearing any and all stories of dogs whose personalities changed (for the worse) when they lost a sibling or when a disability started hindering them. You can share in the comments below or email us at ohmelvinyojake@gmail.com . 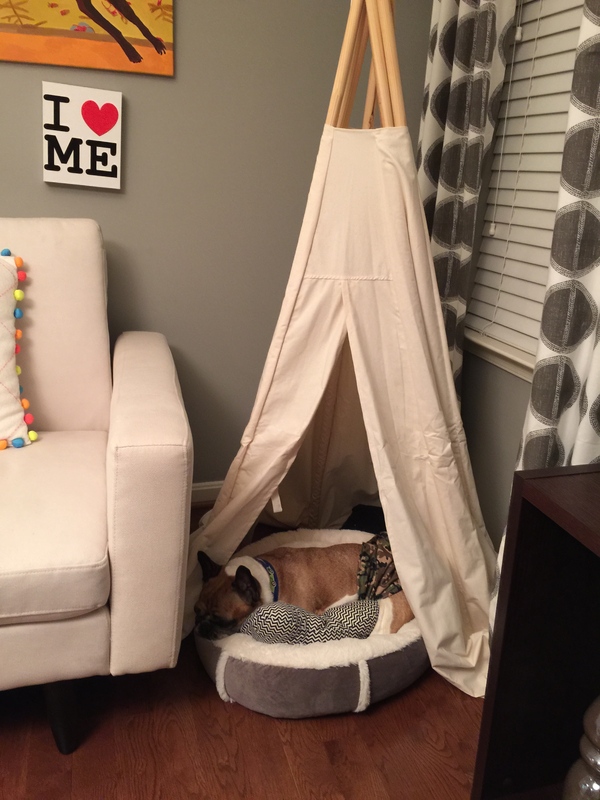 For now, the wild beast has taken to his teepee (in his camouflage diapers) to rest up for the next hunt. I think I’ve mentioned before that I have a (positive) stalking problem. I follow tons of rescues and shelters and I constantly look at (and sometimes visit with the dogs they have). I have done this for years and years and years. It’s not that I was always looking, it’s just that you never know. Visit a shelter dog, you won’t be sorry! A lot of time I will see a dog that will be great for someone I know, and a campaign is started. Before Melvin got sick, I was seriously considering a third dog. The parameters for that dog were that it would fit personality wise, and hopefully it would be a dog we could help (I was looking at elders). In the third dog scenario, it was easier, Melvin would be there to help me. I’d be responsible for training and controlled chaos, and Melvin could take the lead on showing them the dog routine. One key personality feature was always going to be, ‘don’t need/like to play’. 1. Because Melvin didn’t play. The only living creature he ever play-bowed to was me. And 2. Jake doesn’t play normal. His idea of playing is face and leg biting. Also, with all his spine issues, Jake’s not even supposed to hop off a low bench let alone roll around with another dog. Now that I look to our future and know that eventually, the next dog will come. I have been thinking about the differences between that third dog search versus the now second dog search. It is different. It feels a little complicated. In the now second dog scenario, there is no Melvin. Where Melvin was a born leader, Jake is a born follower, and there is nothing wrong with that. But if I bring a new dog into the house and a give a command, Jake is not going to take the lead. He’s going to wait for the new dog to pull up and then he’ll hop into the sidecar. So I need the driver of that sidecar to be a dog that can become a good lead. Also, from a behavior standpoint…Jake with Melvin, not an issue. Jake without Melvin, well that is a brand new world and it’s not always pretty when we are talking about other dogs. 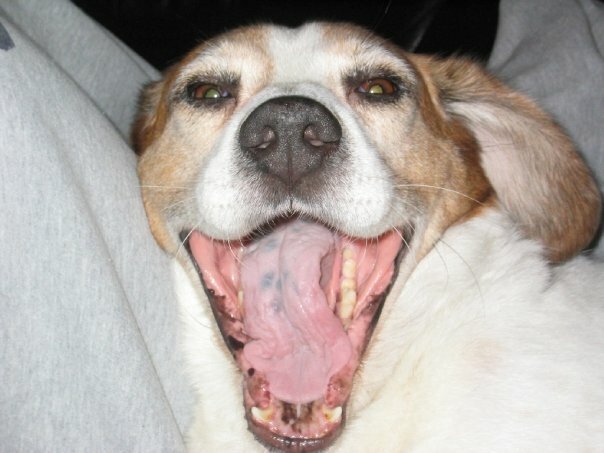 I have a good sense of dogs that would do well with Jake. I lived with one for seven years. So obviously from this post you are sensing that I have been testing out the waters. It’s true. Jake actually had a meet and greet with an English Bulldog named Stanley last week. (I mean Stanley? How perfect can a name be?) And Stanley is an awesome dog. He was surrendered at 4 (he’s almost five) because he couldn’t keep food or water down (most people take their dogs to the vet but his family just tied him up outside and hoped for the best). He was taken in by a local rescue, he got palate surgery. He is healing nicely and coming into his new life of happiness. AWESOME DOG! Jake did great meeting him in our backyard (Jake did less great having Stanley in our house but that we could have worked with). There was a moment when I thought, maybe this is it. But here is the reason Stanley didn’t work for us. As Stanley is coming into joy, he is realizing how much fun playing can be. There was a moment when Stanley was the bowling ball and Jake was the pins (all in good fun) and I suddenly realized that one day with Stanley, and Jake would be a quadriplegic. The rescue ladies agreed that Stanley was a threat to Jake’s ability to remain upright. So we chatted and they said they would keep us in mind for any dogs that came in that might be older or less playful. They left and I did two things. 1. I cried. I still face painful realities about Melvin being gone. I still want it to be Melvin and Jake and the fact is, eventually it’s going to be Jake and another dog. That cry was healing (tears come for a reason). Those tears turned into pride. We’d gotten back out there. We were trying. And that is a lot. We will find the right, next forever. 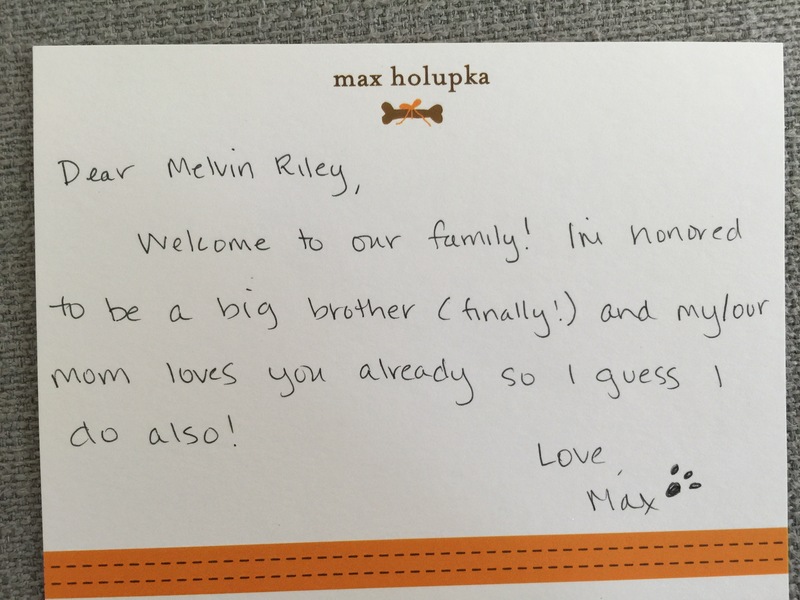 And I have faith that dog will be a little reminder of Melvin (and that will be a good thing for everyone) and a lot of their own self. That dog will probably also be older than four. This is Stanley. He is super cool and he is going to make somebody so happy! 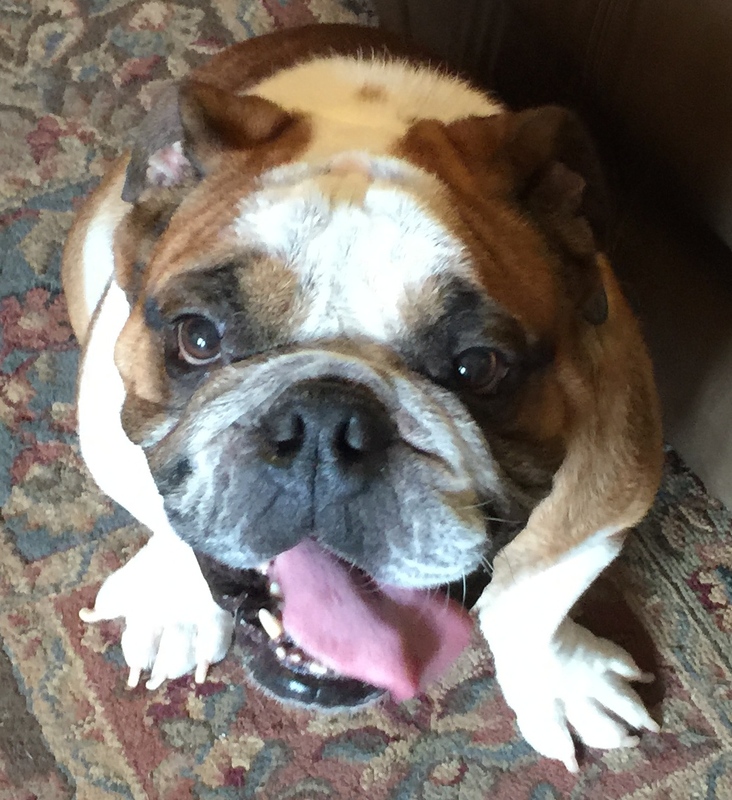 If you think that someone is you, he is available through On the Rebound Bulldog Rescue (VA, DC, MD). A friend reached out to me last week, feeling overwhelmed that her dog was getting older and asking me to remind her why it is I love old dogs so much. I assured her that the things that were overwhelming her, the arthritis, the senior blood work, the ‘what ifs’ were not the things I love about old dogs. No one wants the physical decline to occur, but the reality is, that part happens. It happens to all of us – human and dog. With dogs though, those physical things that happen, they come with a balance of beautiful moments and lessons. Old dogs live to love (and eat). They love you, like no other creature could ever love you. As far as they are concerned, you created the sun and the sun spot they are snuggled upon. They want nothing more than to be near you. And this isn’t about them worshiping their human, it’s about love in the purest form. So many of our (human) relationships are conditional, or memory gets in the way. With old dogs, the love they feel is here and now. You screwed up yesterday? They don’t recall that. Work is gonna be stressful this week? They will be waiting for you to get home so they can love you some more!! They are forever in the present. Sure, they slow down, but that’s a reminder that you should too. Time spirals out of control most days, old dogs just have it right. Linger, saunter slowly down the sidewalk. Glance up at the sky. Forget where you are headed. Lay down mid walk, Life is happening in that very moment, don’t miss a single, glorious minute. Bumps show up on their skin and their muzzles turn gray, they don’t care. They don’t fret about the aging process, they only care that there is love in your eyes. That you snuggle with them. That food shows up as often as possible. They keep it simple. Arthritis kicks in, it’s hard to watch, but then you realize, they don’t complain. They adjust. They don’t wish they were a puppy again. They live for right now. For you, sitting there next to them. Watch the joy an old dog experiences when you get down on the floor with them! And even through creaky bones and joints, THEY WILL CHASE THAT BALL. Because they love chasing that ball and old dogs do the things they love. Oh the lessons they teach! 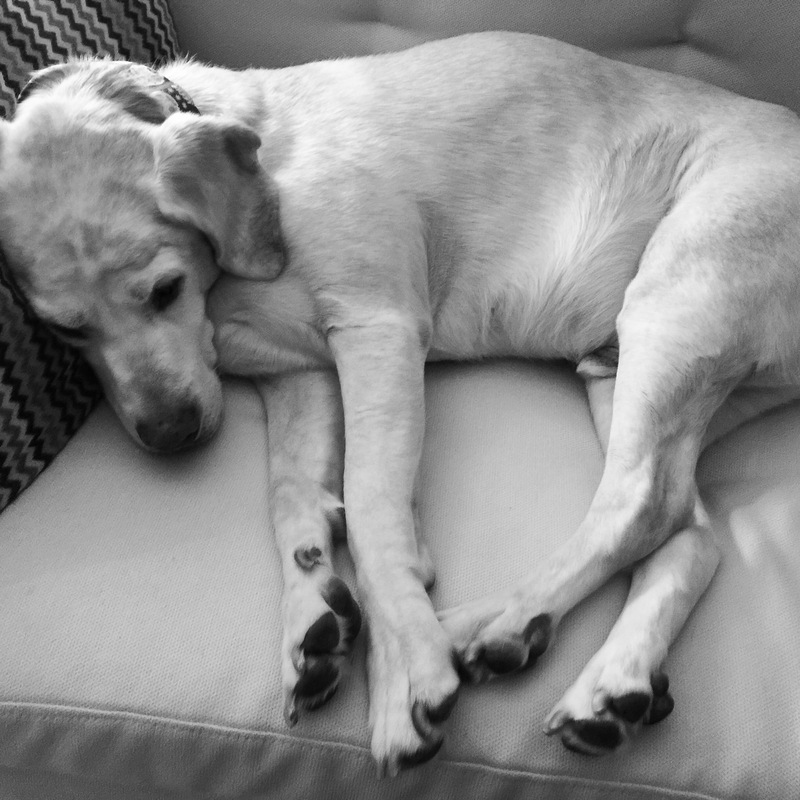 They nap more often and I can tell you with absolute certainty that watching an old dog nap is a beautiful thing. They have faith in what you have surrounded them with. Their home, their bed, their family. Their eyes may cloud up, but they have never seen the real you more clearly. Their eyes have seen the best and worst of you and those eyes have never judged. The things they can communicate with just a single glance can heal you in ways you never imagined. Their hearing goes, and they don’t always listen. Hey, when we are 90 years old, are the rules really what we are going to concern ourselves with? But have no fear, even deaf dogs can hear the treat jar open. You cannot help but laugh. They have accidents. But in that moment when you say ‘it’s ok’ and you clean it up, they will give you their heart. Old dogs have life figured out. I truly believe if they could talk, the world would heal. When life is swirling all about, they remain grounded and true. They will take only what you can give. Nothing is too much or too little. They live only for right now, with you. Go hug a senior dog, go run, do it! Some of the seniors I have been honored to love! Beauty, rescued at 11! Max, teaching the ‘take a load off’ move. 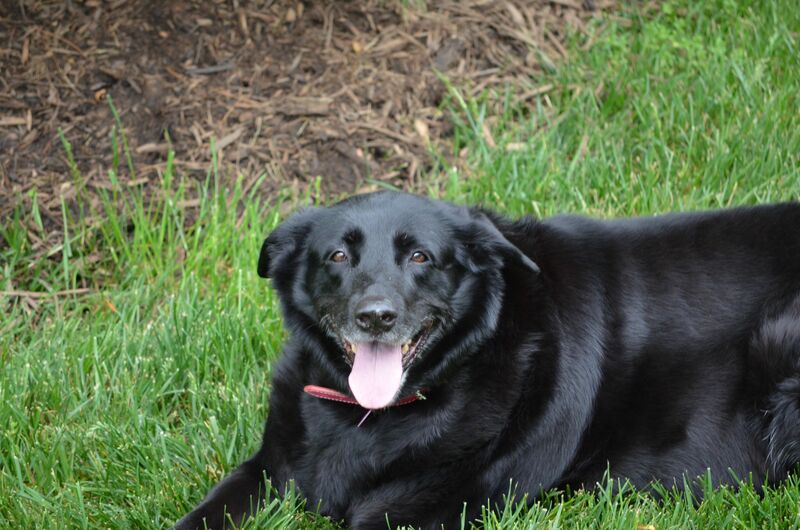 Mollie-Anne rescued from death row and lived until the glorious age of 15! And these two knuckle-heads, both seniors! Of course, he may be my favorite of all the old guys. When I bought my first house, the hardwoods were not hardwoods and they were light. Max’s hair showed up everywhere. So when I got around to putting in real hardwoods, I put in wide, dark planks. For a year, Max’s hair blended in perfectly. Then Melvin arrived. Oh well, visual hair there would be. In this house, because Melvin was (I so effortlessly typed ‘is’ there — still working on typing ‘was’) allergic to everything, hardwoods were the best option. Carpet traps all the things that made him itch. So pretty much the entire house is hardwood. (Medium color — some lessons I do learn!). Then came Jake. Still all good. Then came Jake’s leg’s issue and hardwood is now his worst enemy. He will stand on the edge of an area rug and panic comes over him. It’s like a child on the edge of a swimming pool. He steps onto the hardwood an SPLAT. Then he swims just trying to get to the next rug. I love Jake, but I am not having the whole house carpeted. While we were at the beach, I did notice that he walked better on tile. The tile was a rougher texture and he was able to gain some traction on it. That MAY be an option. But for now, I’m going with ‘plan leap-frog’. 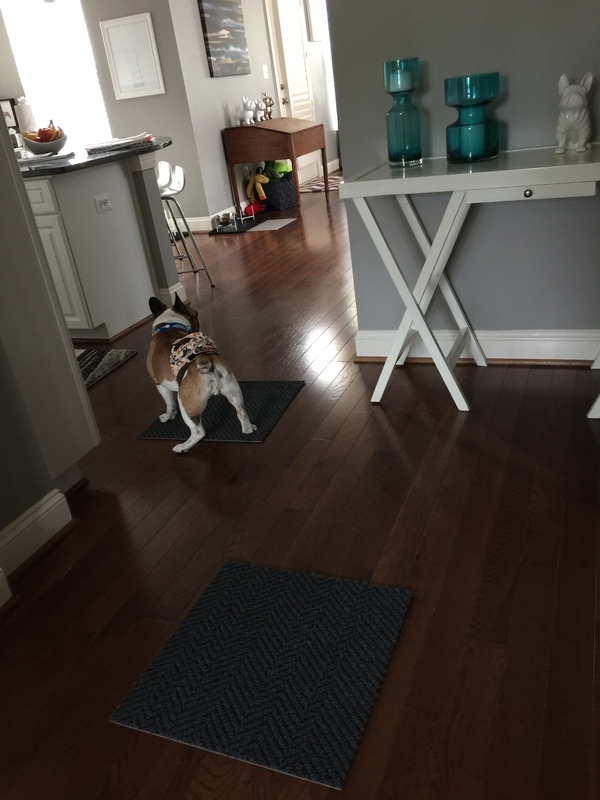 I put carpet squares all over the house, in between the main rugs so that he can leap onto his lily pads. We have also tried: traction socks (they don’t stay on), traction socks with vet taped wrapped around them (they don’t stay on), toenail grips (they don’t stay on), paw pad traction stickers (you guessed it, THEY DON’T STAY ON). If you have any ideas (beyond making him play Frogger), let me know! From the time I got Melvin to the time I lost him, he was pretty much the same dog. He was exuberant, loving, snuggly and happy. He was soulful. As he aged, the exuberance softened (he’d no longer knock you over to get to you) and the soulful side of him expanded exponentially. He grew into himself, gradually. Life for Jake has been a little different. Where I got Melvin at three, I got Jake at five. When Jake came to me he was confused, docile, there wasn’t much light in his eyes. It took him a while to warm up to us. At times, he was downright mean to Melvin. But eventually, he became a loving member of our family. Eager to be around us, less eager to please. Then his legs started failing him and he got a bit frustrated, mean Jake returned. But we persevered through that and he found his new ground. Then he fell madly in love with all things Melvin and he softened up. They snuggled, and kissed and Jake followed his hero around like a sweet little sidekick. Then we lost Melvin and Jake retreated, he went back to being Hans solo Jake. He was wounded, lost. And now he is found agin. 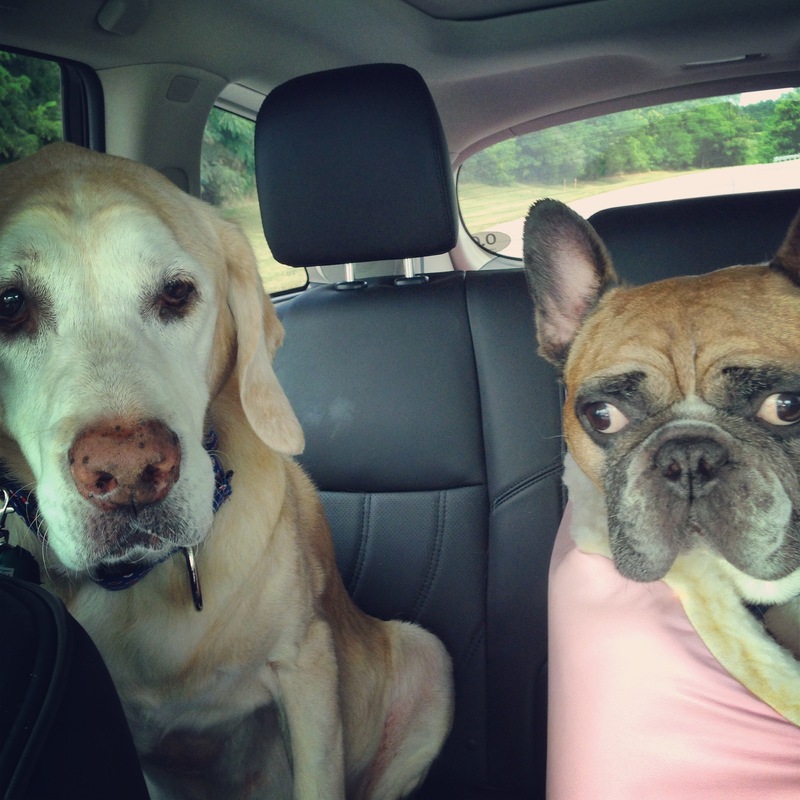 Where Melvin’s life was smoother, even despite all his health issues, Jake’s journey has been a bit more topsy-turvy. But something tells me that the Jake I am getting to know right now, is the true Jake. The on-his-own Jake. Not a follower, not a leader, just Jake. While Melvin lived to be near me, Jake moderately enjoys time spent with me, but he also needs his alone time (hey I get it, I’m the same way!). He spends much more time with me during the day now, but at some point in the afternoon, he heads into the room with the sun and sun spots for a while. When I call Jake’s name, he will lift his head up every time, so I know he hears me. But he only comes when called, some of the time. There is no real rhyme or reason to when he answers my call. Because that is who he is. Sometimes he seeks to please me, sometimes he focuses on what Jake wants. And that is ok. I like this new Jake. Part of him helps get me through the missing of Melvin and part of him is a stern reminder that he is his own dog. “I’ll come when I want to come”. It’s just Jake and I right now. It’s still hard to type that. We miss Melvin a lot. But if it has to be this way, I’m happy for this time with Jake. This is likely the first time in his life he has had a human all to himself. I’m like his lady in waiting. We are very much just living in the moment, not too many plans, we look back every once in a while and there are more smiles than tears. Just existing as a little family of two. It won’t always be this way, so we are enjoying what we have, while we have it. Living in the right now, it’s a good way to be. “Get me a snack woman”.